Click the appropriate entry in the Table of customers. Displays the consent categories that are active for the customer, together with any associated limitation or objection settings. See Viewing customer consents for more details. The customer’s picture, if available. The customer’s first and last name. Click to open the Customer properties page, where you can view and/or edit the customer entries. Click to delete the customer. See Deleting a customer for more details. A Back to list link. Enables you to return to the Customers management page and the appropriate Table of customers. The Event Summary panel is positioned to the right of the Customer Summary panel. It includes a summary of events related to the customer, broken down into categories such as e-commerce, web, retail, digital campaigns and similar. 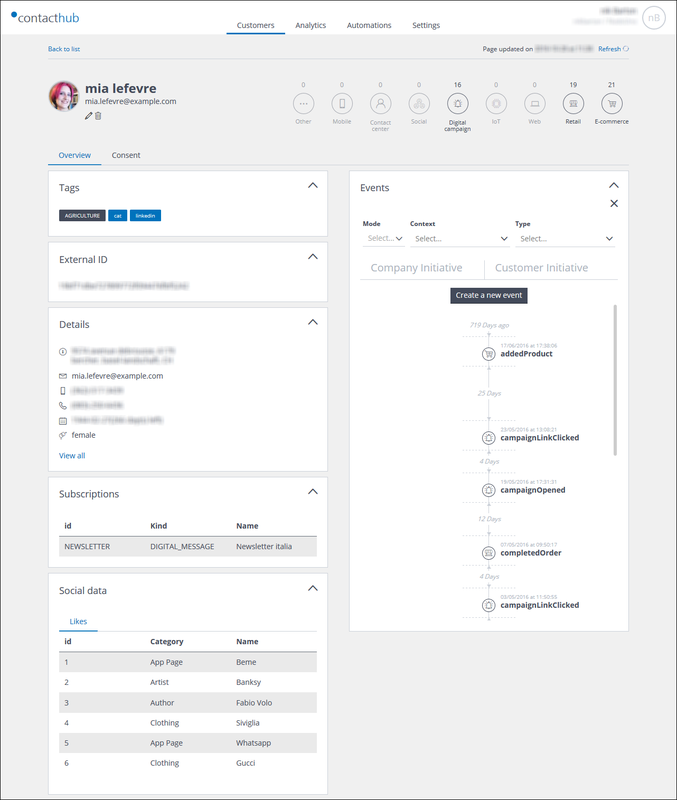 Positioned to the left of the page, the Customer Properties section is made up of panels that are only displayed, if relevant data is available. The tags that are manually or automatically associated with the customer. Displayed if an external system identifier has been defined. Provides access to all of the customer socio-demographic data, according to the Base and user-defined Extended properties. See the Glossary and Understanding Properties and Matching Policies for more about Base and Extended properties. If you click View all, the Customer properties page displays, which includes all of the available socio-demographic data for the customer. Displays a summary of the relevant service and/or digital message subscriptions. Displays a summary of the customer buying activities with relation to the brand. Displays details such as when and how the customer was registered on the system, together with the source of the registration data and any updates. Positioned to the right of the page, the Events Timeline section shows all of the recorded events for the customer, according to the date and time they took place. Customer or company initiatives, or all. The event context, for example, a digital campaign event, a Web event, a retail event and similar. The event type, for example, abandoned cart, campaign subscribed, clicked link and similar. Company and brand initiated events appear on the left. For example, a price has been given to the customer. Customer initiated events appear on the right. For example, the customer made a purchase or opened a newsletter. 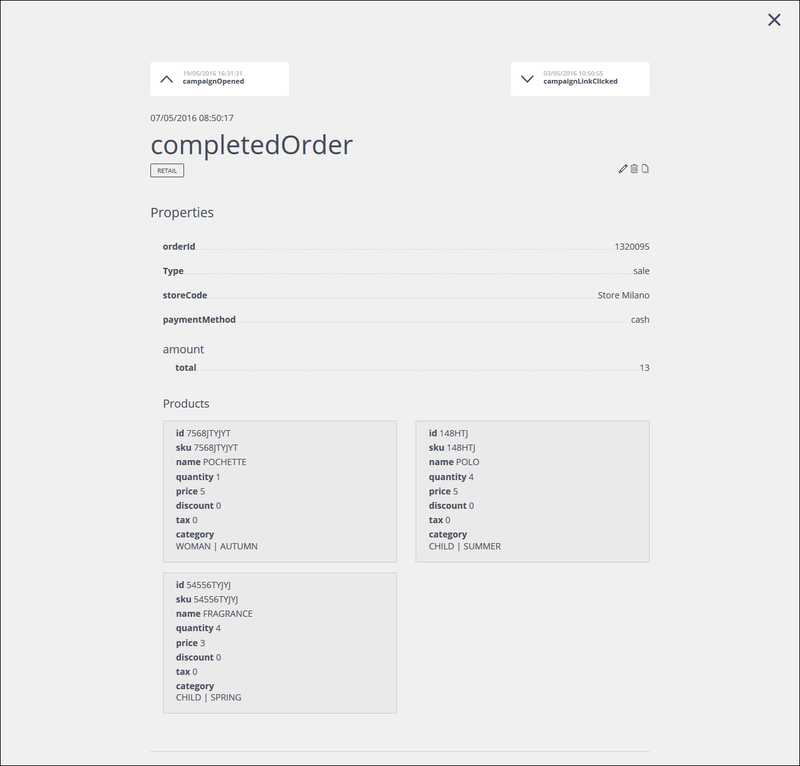 Click any event to display the details, for example, a completed order.